I paused along a ridge in the Little Belt Mountains near Great Falls, Mont. with my oldest son, Joe. It was the day after Thanksgiving and we took a moment to soak in the sprawling scene before us. Rising up like a crown jewel was the snowcapped peak of Mt. Peterson to our west. To the north lay miles of grassy fields where cows and wildlife alike graze to their hearts’ content. There was a sermon here, not so much in the simple reminder I offered of God’s glorious creation stretched out around us, but in the scene itself. The majestic mountains, timber and grasslands glorified the Lord more than my words ever could. Topping it all off like a layer of whipped cream was a thin curtain of clouds through which the afternoon sun shone like a filtered spotlight. It provided enough rays to illuminate the mountains and fields, but not so much to hurt our eyes gazing directly at it. This breathtaking scene had the perfection and glow of an oil painting. Partly because of my age, and partly because of my sense of awe and wonder, I traversed the ridge slowly, with many pauses, as Joe and I made our way back toward where we had gotten out of the truck more than a mile away. There was another reason our steps were labored on the alpine landscape — we were dragging a mule deer off the mountain. This was a well-earned prize, gained after a short stalk, a much longer tracking effort and, finally, a finishing shot taken more than a mile from where Joe had taken his first shot at this magnificent 3×4 buck. Hunters are often glad when success comes quickly and easily. It could have happened that way for Joe, but, in the end, I’m overjoyed that we endured generous amounts of hard work, stress and perseverance before finally standing over Joe’s first mule deer. This event capped a wonderful, seven-day adventure for our family of six in Great Falls, on our annual trip to see Bob and Sharon Guditis, their daughter, Jessica, her husband, Jerry, and their three children the week of Thanksgiving. 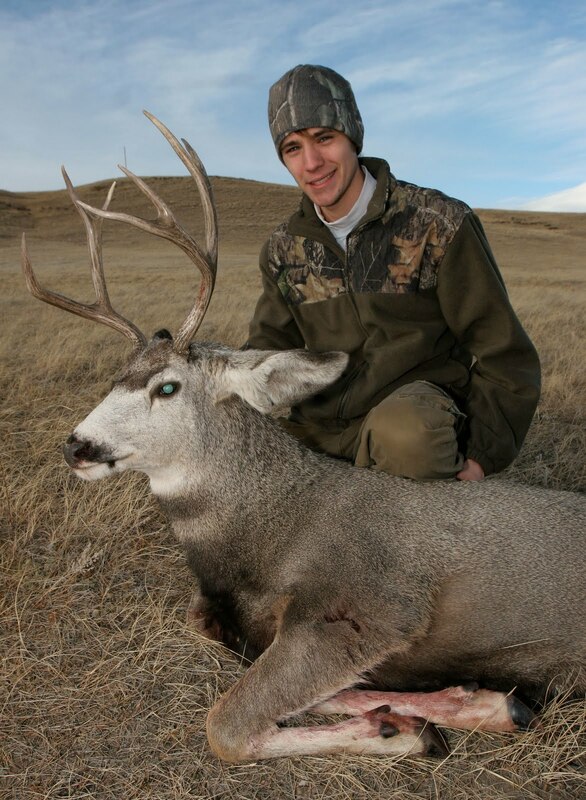 I felt very blessed to be with Joe as he executed a great stalk on the muley. Though only 18, he has seasoned hunting skills that have come through six years of experience, plus a couple more of observing me as he waited to turn old enough to buy his first big-game license. He has harvested three wild turkeys and had taken four deer before this trip, including a beautiful 10-point whitetail in Minnesota when he was 15. Yet, he seemed to have suffered a bit of buck fever when he took aim at this buck. We originally spotted it from a gravel road on our way out of the mountains and back into the valley after a morning of hunting on private land owned by Bob, who is the father of my first wife, Jennifer (who died of cancer in 1995), and is Joe’s biological grandfather. The buck was several hundred yards uphill and Joe and I used the contour of the land to make our way up to the deer’s level. Joe had led another nice stalk two days earlier with his brother, Andy, and Aunt Jessica that led to Andy shooting a nice 8-pointer and Jessica taking a smaller buck that trotted in as Joe was field dressing Andy’s deer. Thus, Joe was confident he could lead us to a shootable distance. In fact, as we neared the top of the ridge, he motioned for me to hang back before he had even spotted the buck. He knew it was just over a small rise and he tried to get himself ready to poke over the top and take a shot. He paused and said he needed to calm down. He could feel his heart beating rapidly because he had climbed the hill quickly — and because his nerves were a bit rattled. Finally, he slowly crested the hill and looked over. When he quickly ducked down, I knew that he had spotted the buck. He raised his rifle and slowly eased back up. Then, he aimed and fired. He turned to me after the shot and I asked him what happened. He said the buck, along with a doe feeding near him, turned and ran. Realizing it was a second buck, I quickly chambered a round in my 7mm rifle and hustled a quick shot at the buck. It dropped immediately and, after a quick inspection to confirm that it was down to stay, we went off after Joe’s buck. The search was stressful and discouraging for Joe, who walked over several small rises without seeing the buck nor any sign that it was hit. Farther down the ridge, we encountered broken timber and a stand of thick brush about the size of a football field. We both realized that the buck easily could have picked a spot to hide here and never be spotted by us. This is a classic trick whitetails often employ. I could feel Joe’s heart sink as he scanned the timber in desparation. Meanwhile, I turned to the Lord in prayer and asked both God and St. Anthony (who has never let me down) to help find the buck. We continued walking in the timber, then neared the end of the ridge. We reached the edge of the first stand of timber, then saw an opening of about 50 yards before a second strip started. This was it, I thought. Either we would find the buck here or give up the search. Joe tiptoed ahead, looking across the opening. Then, he ducked quickly and backed up. Before he spoke, I knew he saw something. “It’s a deer,” he said. “Is it the buck?” I asked. He scanned further and said the buck was there. Actually, there was a group of three deer — the buck, a doe and a smaller buck. The doe was standing still and the bigger buck was coming up from behind, with the smaller buck following along. I told Joe to go ahead and shoot. He lined up his rifle, but couldn’t steady the crosshairs on the deer. He then asked for the shooting tripod that I had brought and I set it up for him. He put his rifle on it, paused and fired. The buck wheeled and ran over the end of the ridge and out of sight. Despite the buck’s disappearance — again — I had a feeling Joe had made a fatal shot this time. As we waited to contemplate our next move, the small buck made his. The doe ran only about 25 yards or so after the shot, then stopped and stood broadside to us. In a matter of seconds, the smaller buck came up from behind and seized the opportunity to breed the doe. Joe and I got to witness a rare moment in the lives of deer. We marveled at the chance to see such a private act, then quickly turned our attention to the other buck. We walked to where the buck had been standing, and Joe soon found a good blood trail. We crested the hill and soon saw the buck bedded at the edge of the timber — still alive. Joe fired a pair of finishing shots and then we walked over to his trophy. I asked him what he felt at that moment and his answer was, relief. That’s understandable. It was agonizing for him to think that he might lose this buck, especially when it was so close for his first two shots. He estimates the deer was within 100 yards both times. As it turned out, he did, in fact, hit the deer with one of those shots, but the bullet went low, striking the deer in the front leg. As we talked about the experience with Bob later, he noted that God often surprises us with his blessings, in order that we will walk away knowing he is in charge — not us. I couldn’t disagree. The trip had several pleasant surprises, which usually came right after we faced stiff challenges. For example, we hunted hard the first two days and got skunked before I finally got a whitetail doe on the third day when we followed a group of does that ran for a while, then hunkered down in a small ditch on a piece of state land that offered a perfect stalking opportunity. In the end, it was a successful, enjoyable and glorious week. The same day that Joe got his buck, Jerry shot a big 8-point whitetail, and his 12-year-old son, Brandon, took his first deer, a small doe. So, seven of the eight members of our hunting party harvested deer. Bob was the only one who did not fill his deer tag. But, we ended up giving him Joe’s buck, which we are having made into jalapeno pepper sausage, his favorite. Tonight, we will celebrate the hunt with one of our favorite wild game dishes — grilled venison tenderloins. I greatly look forward to that, and also to the prayer of thanksgiving we will say to the Lord before we partake of the harvest from his bountiful creation. ← What’s in a name? A lot, if it’s yours!